Patient with over 30 warts on the sole and between toes. 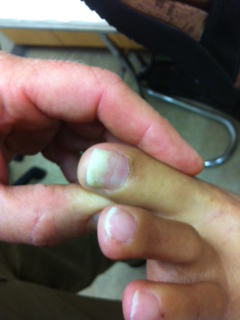 Patient failed CO2 laser, freezing, efudex, topical acid, bleomyecin injections. Patient returned to work in high demand job on his feet, the same day as treatment. Patient chose no numbing medicine. Others may choose to have it. After the procedure, patient returned to heavy work that required him to be continously on his feet. Patient experienced no pain. Patient showed no discomfort.